Leverage the eyes and minds of your entire team to grow your additive manufacturing. The AM Part Identifier provides a streamlined website to collect potential AM use cases. The market-validated software then evaluates the part suitability based on a technical and economic criteria. Adding employees and customers to augment your AM experts quickly adds AM parts to your production. 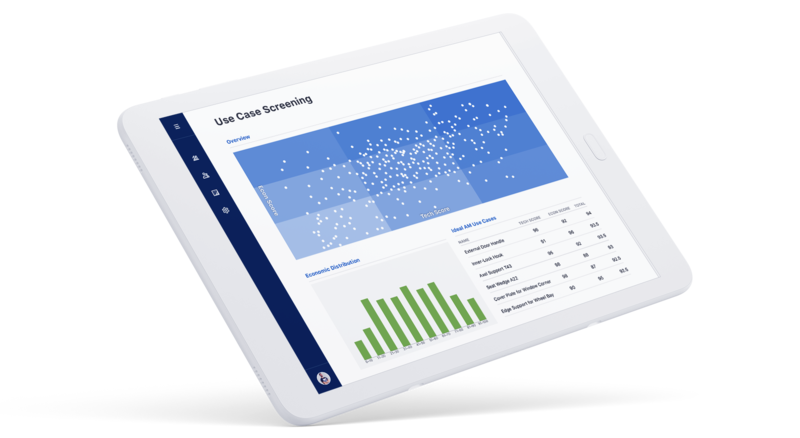 AMPI Use Case Screening is always accessible to your entire organization to add potential parts into the evaluation cycle. Employees are guided through a clear series of questions to classify the part and gather the information that is needed. The questions and evaluation criteria have been developed to empower anyone to input the information and get a market-validated assessment of the part as an AM business case. The most promising parts are passed along to your AM team to move into production. Production decisions should be made with data. Each use case submission gathers the most important data points about the economic impact and technical specification for each part. 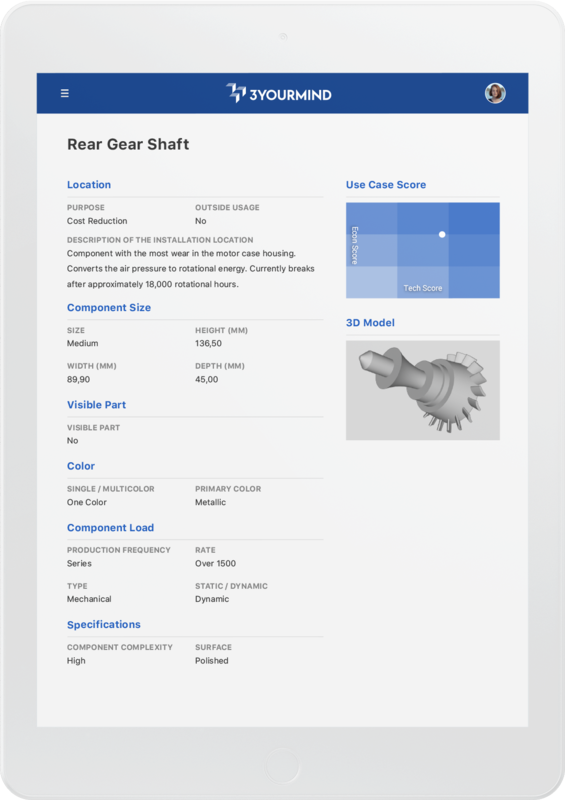 That equips your team to make intelligent business decisions about which parts should shift to additive manufacturing. Because Use Case Screening is available to accept submittals from your employees as they work, they will tend to input the biggest problems and opportunities as they encounter them. The AM Part Identifier takes the last step to weigh both the employee suggestion with the economic and technical realities and to earmark the most relevant opportunities for additive manufacturing. The collection methodology and evaluation criteria were developed in close partnership with AM consultants with decades of experience. That wisdom was packaged into a software tool that can provide an accurate first-step evaluation of parts and scores their potential so that AM experts can move the best use cases into production. Your employees get instant feedback from the software to the suitability of their part submission. But more importantly, your experts can organize the reports on submission scoring to match their unique business scenario and their best use case matches. That criteria can be customized to match the most pressing needs of specific departments from shifts in supply chain stability to changes in production demand. From CAD designers to project managers from the procurement department to your customers, there are applications for additive manufacturing that can add speed and save cost for your company. If you are like most companies, you do not have a pathway to get those ideas into production. AMPI Use Case Screening can be added early to evaluate designs or aftermarket to find spare parts. Source use cases from every corner of your business. Adding the eyes and ears of your entire team ensures the best AM use cases are always identified so your company stays efficient and cost-effective well into the future. The Use Case Screening allows them to submit new ideas as they occur and get real time feedback about additive manufacturing potential. AMPI is perfect for designers: knowing right away which parts should be manufactured with AM enables them to tailor their designs. They can validate the business potential of AM simply by using the technical requirements of the project. Smarter designs mean better parts and higher productivity. When a customer requests a part that may be a fit for additive manufacturing, screening can save hours or days of unnecessary phone calls and emails. Your sales team can verify in seconds whether that customer request can be executed using AM and only move forward with the best use cases. Your procurement team can review specific parts for AM suitability using the data they already have on-hand. They can set up alerts based on specific triggers within part life cycles. This information will improve their decisions about purchasing channels, suppliers and purchasing new equipment. 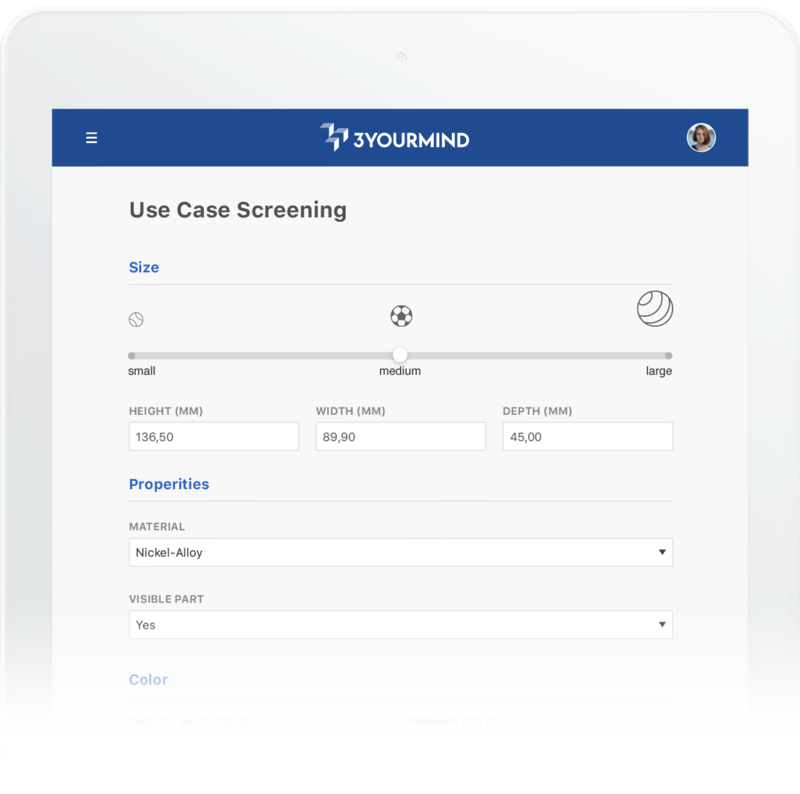 The AM Part Identifier is ready to connect directly to our 3YOURMIND Enterprise and eCommerce platforms. This allows your AM expert team to transfer parts with a strong analysis score directly into the pricing and ordering ecosystem of your company - with a single click. Communication around the project can be easily routed continued between your procurement team, product owner and production floor directly alongside the digital information. Are you ready to start taking advantage of the most complete end-to-end AM workflow on the market?